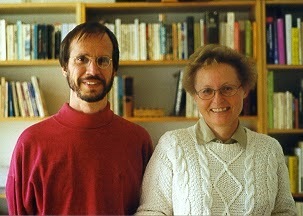 Back in around 1998, I think it was, I was fortunate to meet a member of the Chilean branch in person when Ursula “Ulla” Wyneken was in Germany doing research at the university in Magdeburg. We got together several times during her stay. One time we decided to pay a trip to where our family all began, to Stade. While there we thought it would be a good idea to see if there were any traces left of Rüstje, the place her ancestors had lived. While doing the research we discovered that there is a forester’s lodge there now. 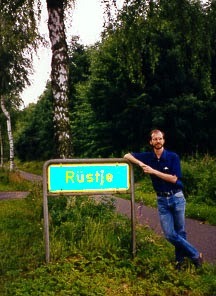 I remember being very excited to find out that there is an actual phone number at Rüstje. The day that Ulla and I spent in the area we first took a look at the former Hanseatic city of Stade, where the very first Wynekens are recorded. Then we drove the 15 minutes to the nearby village of Helmste to try to find the forester’s lodge at Rüstje. We were successful! 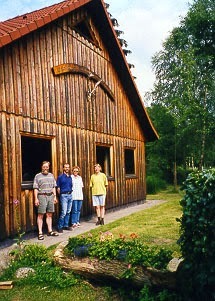 We rang the doorbell and were greeted by Herr Martin Seidel, the forester, and his wife. After I explained who we were and why we were there, they became almost as excited as were were to rediscover this old family link. They were kind enough to invite us inside and we had a very nice visit for an hour or so. When I remembered this archaeological find recently, about 16 years after Ulla and I were there, I realized that maybe some of the German speaking members of the Rüstje branch that I am in touch with might be interested in this information. I wrote Herr Seidel by e-mail, hoping that he was still at Rüstje after all these years. He responded right away saying that of course he remembers our visit to their lodge. I asked him for copies of any articles he might be aware of that discuss the archaeological findings on his property. He sent me me scans of what he has and I am posting two of these articles on my website. Unfortunately, the articles are only in German. During our chat, the Seidels mentioned that there had been some archaeological work done at Rüstje and that the work had uncovered the remains of an old building. They took us out to the spot, very close by to the lodge, and showed us. It was a very exciting feeling for me to realize that I was right there on the ground and possibly within the borders of the actual house where Ulla’s ancestors had been born, spent their childhood, played and grown up. The Seidels showed us an article describing the archaeological findings that had been uncovered. The article Mittelalterliche und neuzeitliche Besiedlungsspuren in Rustje by Susann Busching discusses the excavation work that took place in 1991. Then there is an excerpt from Sagen aus dem Lande zwischen Niederelbe und Niederweser by Hans Wohltmann. This is a book of stories related by people from the general geographical area where Rüstje is located. 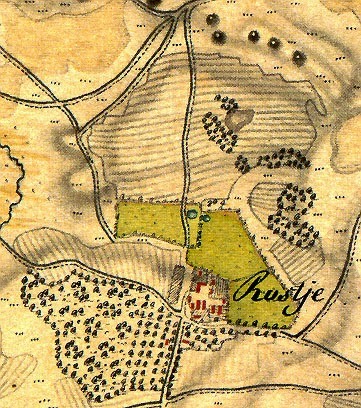 It contains two stories about the proud owner of the manor at Rüstje whose name was Wyneken. This Wyneken does not appear in the story in a very favorable light or as a very likable person. That of course is not at all surprising, if for no other reason than because the stories are told by Wyneken’s tenants. We all know how likable Wynekens are … In any event, the stories are over 200 years old so none of us modern day Wynekens need to take the stories personally. This entry was posted in Uncategorized on 2014/09/22 by mpwyn.